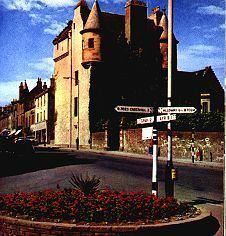 Maybole castle at the foot of High Street is a typical Scottish Baronial Style castle and was formerly the town house of the Earls of Cassillis (pronounced Cassels). It has a very fine Tudor oriel window facing up High Street in what is known as the Countess's Room. Legend has it that the Countess of Cassillis who ran away with Johnnie Faa, the King of the Gypsies, was imprisoned in this room after the couple were caught and Johnnie Faa was hanged on the Dule Tree at Cassillis, but facts are more mundane and prove the story to be merely a fable. The Castle stands at the top of the Kirkwynd which was formerly the street leading to the Collegium and the ancient burial ground of the townspeople. This old cemetery contains many interesting tombstones and over 20.000 people are buried in this small area which barely contains an acre of ground. "Old Mortality" immortalised by Sir Walter Scott, visited the cemetery from time to time to clean the tombstone of a Covenanter buried there. 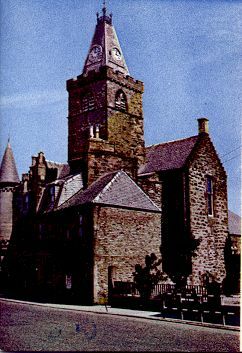 The Clock Tower is all that remains of the Ancient Tolbooth and the Town Hall was built adjacent to it last century to form the Town Buildings. These contain a large hall for concerts, dances, etc., a smaller hall for lesser functions and the Council Chambers. The latter contains many interesting items, such as the Town Staff, Visitors Book, pictures of local interest, etc. It also contains the old town bell which was cast in the town bell foundry by Albert Daniel Geli a Frenchman. on 6th November. 1696. It was in this chamber that General Eisenhower was made a Freeman of Maybole. In olden times the House of the - Carmelite Friars stood adjacent to the old Tolbooth and was known as the Hall of the Whitefriars giving the name of Whitehall to the street running westward of the present Town Hall.